This month for Keto Delivered, I really wanted to revamp the traditional keto condiment shelf. What do you usually find yourself reaching out for in the fridge when you need a little bit of sauce on top of your burger, eggs, or chicken? You might be a lover of ranch, reduced sugar ketchup, mayonnaise, sriracha, or good ol’ hot sauce. For me, it’s always mayo or hot sauce (or a mixture of the two). I wanted to take my two favorites and share them with you – in elevated style. Alongside that, we have a few extras that any keto pantry should have – ranging from health beneficial items to items that just make food taste better. I put a lot of thought into what I wanted to bring, recipe wise, and I hope you get to enjoy each and every bite! So, what’s in the box you ask? 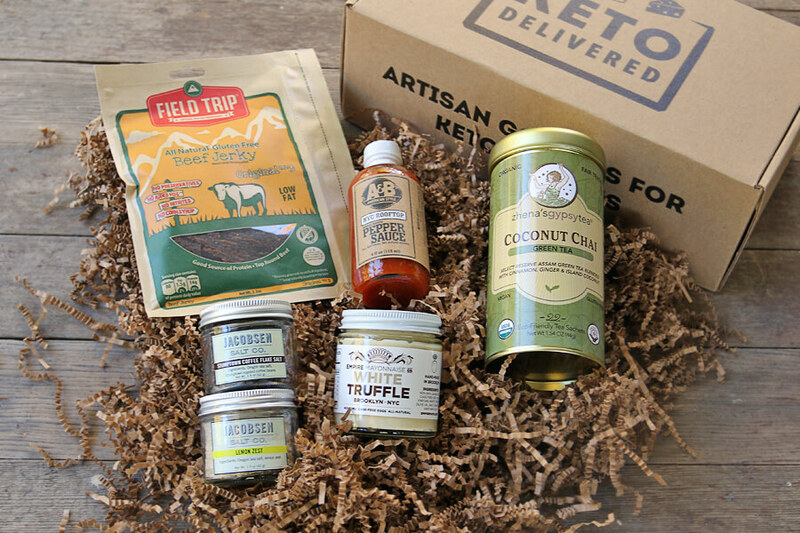 Let’s get into it: here’s the third month of Keto Delivered, unboxed for you! 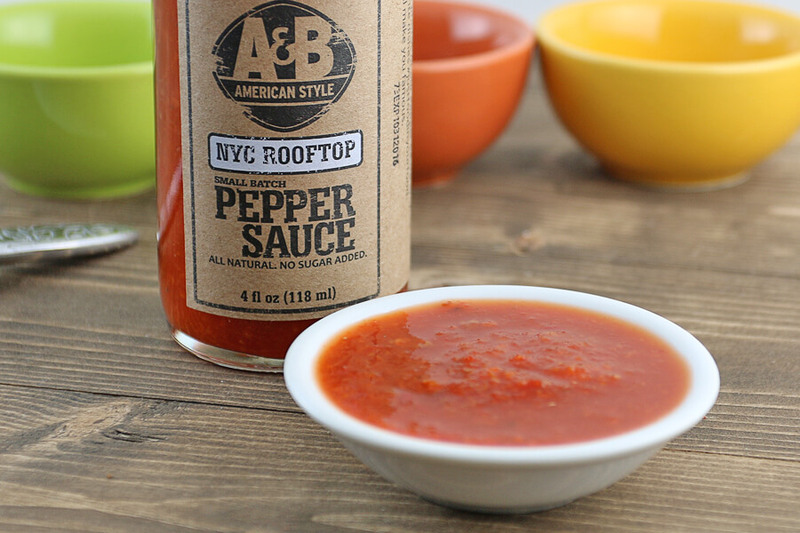 A&B American Style NYC Rooftop Pepper Sauce is made with chilies grown in NYC on a Rooftop farm. Hopefully, that was clear from the name. They spend their time crafting killer products, not silly names. The climate in NYC is unique for growing chilies and creates a very delicious, unique pepper that they take care to highlight. These peppers come down an elevator and go around the corner into the bottle for maximum freshness. Flavor. Not just heat. All of their Pepper Sauces are made without added sugar or artificial preservatives and are very low sodium. Simple. No sugar. Nothing artificial. Just food in your food. Let me start off by saying this is some of the best hot sauce I’ve tried. Usually I’m content with using Frank’s or Tabasco, but until I tried A&B Pepper Sauce – I truly didn’t know what I was missing out on. They do a fantastic job at balancing the heat so the actual flavor of the peppers come out beautifully. Generally speaking, I can’t find many sauces like this in the supermarket. You’re usually buying cayenne pepper mixed with vinegar and water if you buy a hot sauce that’s low in carbs. While it can taste good, it’s just missing something. You’ll see exactly what I mean when this magic condiment touches your taste-buds. Our featured recipe this month was using A&B Pepper Sauce to create some amazing Cheesy Buffalo Chicken Bites. If you’re familiar with Any’tizers or Chicken Crispers, then you’ll be an immediate fan of these! 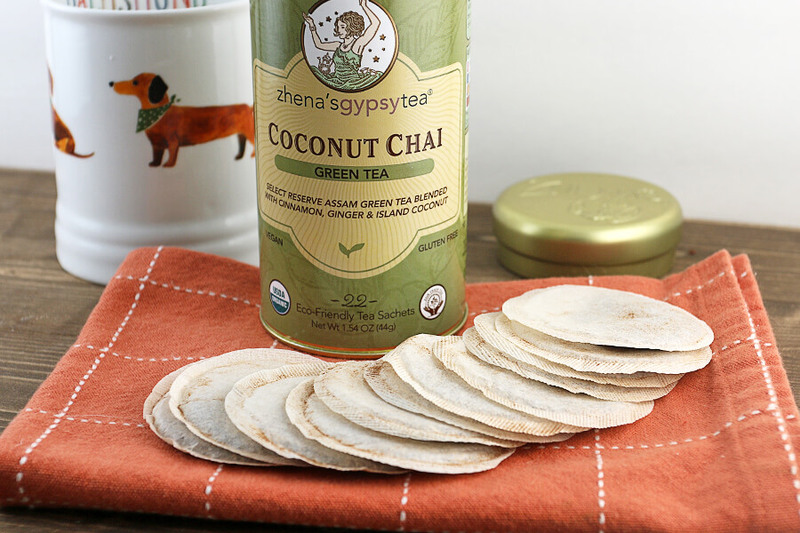 Zhena’s creates small batch, artisan crafted organic teas to delight your senses, please your palate and to enhance your life with health and happiness. An early supporter of the Fair Trade movement, Zhena’s is dedicated to alleviating poverty and building equitable and sustainable trading partnerships. Reduce levels of harmful free radicals in the body. Improve brain function at a higher level than caffeine alone. Increase rate of fat being burned. Lower risk of type 2 diabetes. If that isn’t enough to want to grab some green tea right now, let the taste speak for itself. Whether you like iced tea or hot tea, this is perfect for any time of the year – and the flavor profile is definitely on point. If you’re not too big on tea, make sure you try adding a little bit of added stevia and heavy cream. More unconventionally, you can even use these as a spice mix. I’ve done chai mug cakes in the past, so I figured why not use a green tea instead? Mug cakes are perfect for breakfast, lunch, or dessert and pack a ton of fats in. Did I mention it tasted fabulous as well? Note: Boxes came with either Lemon finishing salt OR Stumptown Coffee finishing salt. 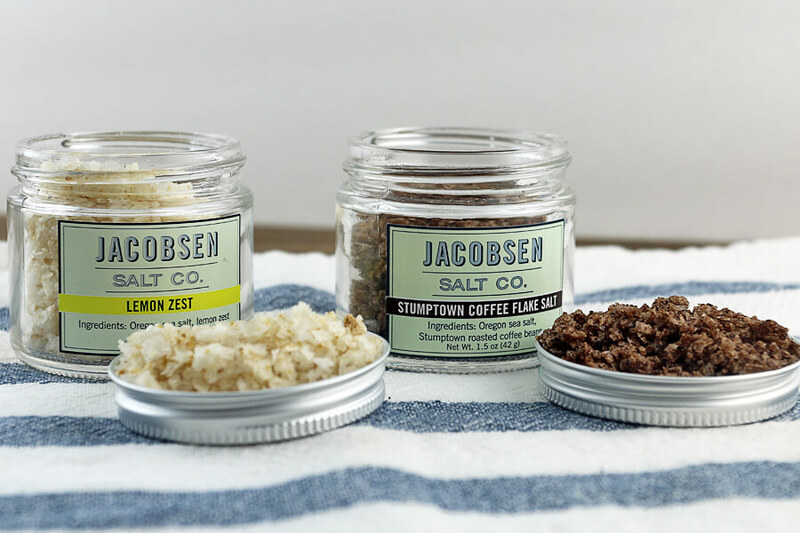 Founded in 2011 by proprietor Ben Jacobsen, Jacobsen Salt Co.’s mission is to create America’s finest flake and kosher sea salts. Their infused flake finishing salts use the finest ingredients to create exceptional culinary experiences. Harvested from the cold, pristine waters of Netarts Bay on the Oregon Coast, Jacobsen Salt Co.’s flake and kosher sea salts have gained much critical acclaim for their beautiful and pure taste, texture, and appearance, and are used by chefs and home cooks around the world. Finishing salts are something that I had never heard of, let alone had the opportunity to try. Once I had my hands on this, I can really say that it does make a world of difference to the food. Typically speaking, restaurant food tastes so good because of the extra salt they add. Some studies even show that restaurants will salt their food up to 40% as much as home cooks. Adding salt to your food is not only great for keto (we deplete sodium much quicker than a standard diet), but it makes the food taste great, too. This month we featured two blends: Lemon Zest and Stumptown Coffee. Give a try to our Lemon Butter Salmon with a Lemon Zest finishing salt or a beautifully cooked ribeye steak with a Stumptown Coffee finishing salt. It’s definitely an experience you will remember! 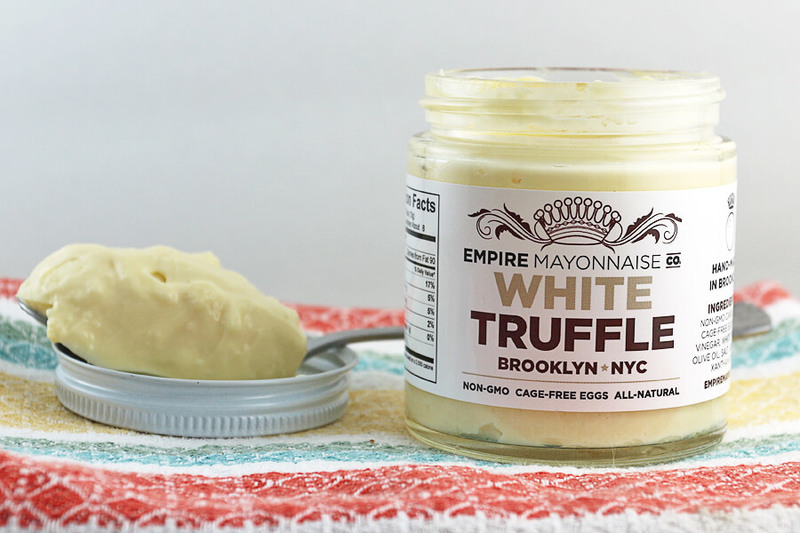 Empire Mayonnaise offers a line of exotic flavored French-style mayonnaises. With recipes developed by world-renowned chef Sam Mason, their seasonal flavors are made using only non-GMO oils that are cold infused with spices and other natural flavors. They use a yolk-only recipe with eggs from happy, cage-free chickens. Empire Mayonnaise is handmade in-house and is passionate about delivering a truly one-of-a-kind, all natural gourmet condiment. If you’ve been a complacent user of Hellman’s or Duke’s mayo for the last few years, you’ll be in for a real treat! This month we featured a white truffle mayonnaise, bringing an amazing earthy taste that can go along with so many dishes. A simple side like Elevated Coleslaw could happen, or you can spruce up deviled eggs in a matter of seconds. These guys also offer some other awesome flavors, including: Ghost Pepper, Bacon, Sriracha, Rosemary, Red Chili, and Roasted Garlic. Just imagine the flavor combinations you could create. Or better yet, think about how simply you can elevate a dish with little to no effort. It’s a perfect condiment to have on hand at any given time of the year – whether you want to impress your guests or even yourself. 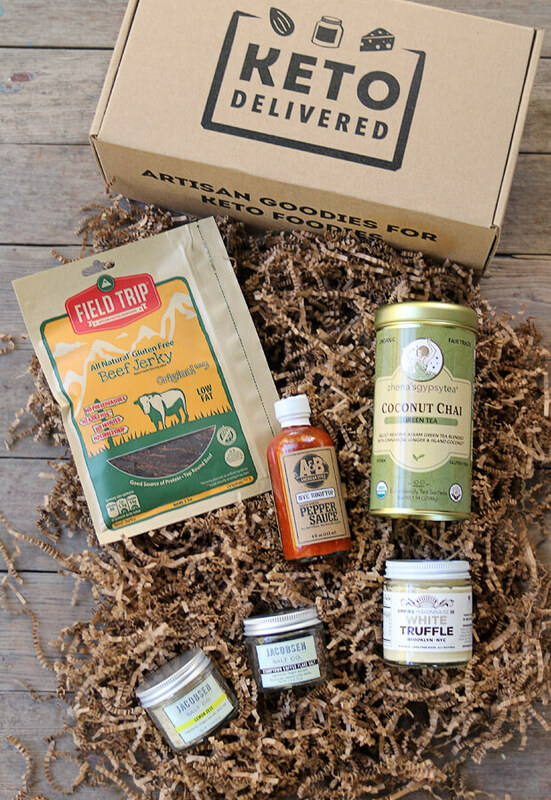 Field Trip Jerky, purveyor of premium, all-natural jerky – founded in 2010 by three friends, Scott Fiesinger, Tom Donigan, and Matt Levey looking to escape corporate life, Field Trip Jerky is a protein-packed, portable and healthy snack, perfect for fueling any adventure. 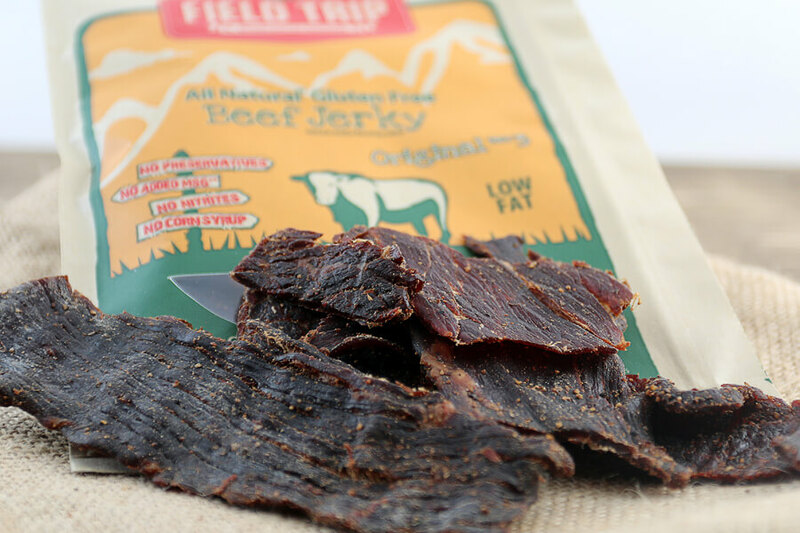 Field Trip Jerky is all natural and does not contain MSG, nitrates, preservatives or corn syrup. There’s not too much to say about this jerky other than it comes through on the flavor they want to deliver. It’s a traditionally cut jerky that stays true to what you know and love. An added bonus as always is that they are honest with their ingredients. There’s no hard to pronounce names in the ingredients and their jerky isn’t doused with chemicals you don’t want to see in your food. I hope you all enjoyed taking a peek into the third month of Keto Delivered. I’ve been loving trying, sourcing, and talking to all of the great businesses around the US that want to be a part of this. I hope you’ve been enjoying the items also – and go back to re-order more to support the amazing people behind the products. If you haven’t signed up yet, make sure you get on the list for the November box before the 20th. We usually sell out early, so make sure you get in early. You can head over to Keto Delivered and sign up now!